Long spools of white rope run through pulley sheaves and wrap around bodies, explicitly connecting the artists’ movements above and off the ground. Like the booms and sheets of a sailing ship the performers are hoisted and swung by one another to create striking tableaux and breath-taking dynamics. The actions of one acrobat affect and implicate the movements of others in a precise negotiation of cause and effect. By a Thread offers rich visuals of inventive aerial acrobatics from some of Australia’s best emerging circus artists. With intense training in a breadth of contemporary circus disciplines, the performers have pooled their knowledge and skills, and then exploded the traditional boundaries of these disciplines to create a show where classic techniques are used in expansive ways. 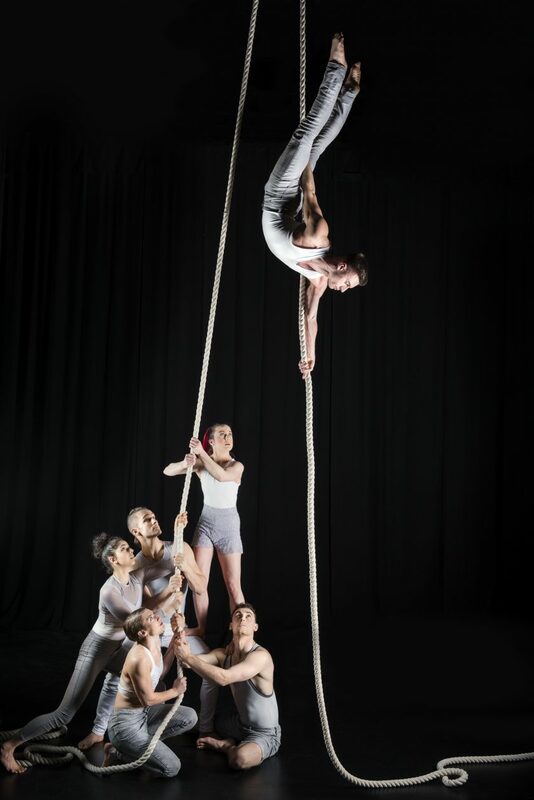 One Fell Swoop is a contemporary circus company that aims to re-examine the dynamics of acrobatic ensemble work and the relationships within it. Based in Melbourne, One Fell Swoop lets audiences viscerally experience the balance of joy and risk inherent to group acrobatic performance, creating powerful works on the cutting edge of contemporary circus practice.